I love Twitter. There…I said it. I might even dare to say (though I’ve only had a personal twitter account for a week) that I may love twitter more than Facebook. OK, I was just joking on that one, but seriously, Twitter has some good pros that all should look into. Firstly, with Twitter you can follow anyone in the world, which really helps one keep up not only with their friends, but with celebrities, magazines, companies, and funny people they don’t even know. Unlike Facebook, there is no stigma attached to users who update their “status” every other minute. AND, there’s no pressure or bad feelings if no one responds to your tweets. Whereas on Facebook, I always feel like a loser if my profile page is full of nothing but my own status updates. No comments on Facebook to me is a sad day. But you see on twitter, it’s not really expected that reply to anyone. Nice, sure, especially when someone with 1,000 followers responds to you, but it’s not expected. Next: Twitter knows everything. Seriously. If it’s happening in the world, Twitter knows first. And you can follow news sources on Twitter, which will help you trust the outlandish tweets…like Obama is an American Citizen (though I am pretty sure that they checked on that before he ran guys…). For a person who doesn’t read news blogs, or watch the news on TV, or read it in the newspaper, Twitter is quite a reliable and fast alternative, often pointing me towards articles that I can read for self-betterment. I’m sure this is a discussion I will continue in other entries, but come on. 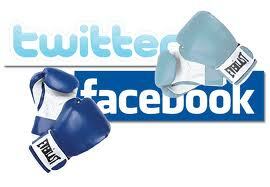 Both Facebook and Twitter are awesome, but in the end it comes down to the fact that I love rooting for the underdog. And come on, the real reason people aren’t on Twitter is because they don’t really understand what it’s all about. Check it out folks, test the water, but in the end, I’m pretty sure you’ll end up seeing things the way I do. Previous Previous post: Wo Dje Boat!